Without a doubt, every new mom and dad starts searching for a comfortable nursery glider after the first few night feeds. 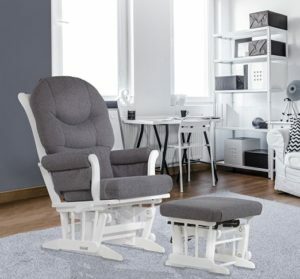 There is nothing quite like a really comfortable and relaxing small nursing chair for adding to the pleasure of holding your baby in your arms. Many parents just re-purpose one of their old comfy chairs from another room in the house, but you will soon find out that your baby will usually settle easier to a rocking motion. 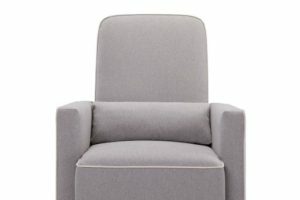 A well made and comfortable small glider chair where you can relax and rest, definitely beats walking up and down rocking your baby at 3am in the morning! One of the problems however, is that many nurseries are cramped for space. This is particularly relevant for parents who live in apartments, but even houses can have small nursery rooms. The problem now is that you need to look for a narrow glider for a small nursery, as well as a glider that is comfortable. We can all appreciate that in a small nursery, trying to fit a cot, dresser and nursery glider all in the same room can sometimes be quite challenging. This is particularly relevant when you have to troll through so many product descriptions looking for nursery gliders you like that are also narrow enough to fit into your space. That’s why I have created this Top 10 list of the narrowest nursery gliders that are also affordable. So along with having a nanny cam in the nursery, you can have a really comfortable and stylish, but NARROW nursing glider. The Brisbane nursery glider by Naomi Home has the narrowest width I could find. At an external measurement of 23 inches, this small nursery glider is just under 2 feet wide, including the padding and arm rests. So if you absolutely want the narrowest nursery glider ever, then this is going to be the best glider for your nursery. It comes in a dark or light colored timber frame and a number of different upholstery designs (100% polyurethane foam). Of the different design options for this glider, the one that has a micro-suede upholstery in cream with an espresso finished timber is a Best Seller on Amazon (seen in the above image). Narrowest width at 23 inches. Comes with a separate and matching ottoman (this glides as well). Maximum weight capacity is 250 pounds. Easy to clean and cushions are machine washable. Very smooth and quiet gliding motion. Sturdy and easy to assemble. It’s comfortable and I like the side pockets. 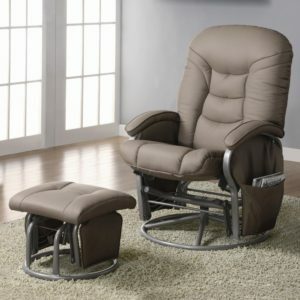 I purchased two of these rocker/ottoman sets and they arrived safely packaged, and quicker than the expected date. It took about 20 minutes to easily put them together and are quite comfortable. I love this glider. It goes perfect in my Little ones nursery and it quite comfortable. Can’t beat that price. Beautiful chair, great quality for the price! This nursery glider doesn’t have a locking mechanism for when you want to stand up, but customers don’t find this to be a problem at all. It also doesn’t recline, it only glides back and forwards. The height of the back from the seat to the top of the cushion is only about 24 inches, so this might not be the most comfortable nursery glider for tall people who want to rest their head. Lastly, a few online customers have noted that if you lean too far to either side (maybe to pick up a toddler), this glider tends to tip over, which seems to make sense when you look at the overhang of the seat. The Naomi Home Nursery Glider is not ideal for tall people who want to rest their head against the back of the chair, it doesn’t recline and has a potential to tip sideways. 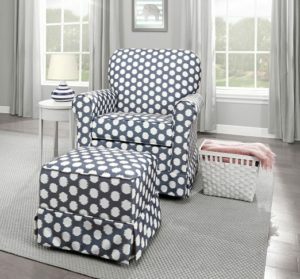 On the positive side, as far as being a glider for a small nursery is concerned, customers really love its comfort, the ample side pockets and its price (less than $150). Stork Craft are a well-known brand and their Hoop Nursery Gliders have the second narrowest external width of 25.75 inches. So it’s just over 2 feet wide, but if you fill up the side pockets then it might be too wide for your space. This nursery glider has a solid timber frame and microfiber upholstery, is easy to spot clean, but the cushions can only be hand washed, not placed in the washing machine. The Stork Craft Hoop small nursery glider is a very traditional looking and very stylish piece of furniture for your nursery and will look just as good in your family room, when your babies are grown. Dark timber and light upholstery. Generous seating area, despite being narrow. Metal, enclosed ball bearings for a smooth gliding motion. Easy to spot clean and hand washable. Easy to put together, glides smoothly, I love this chair. Bought this for my mother as a gift and she absolutely loves it for putting her grand daughter to sleep. Was very easy to put together and is very comfortable ! t’s very sturdy and comfy. Really good back support. We absolutely love it! Great for the price. Had it for over 2 years and used it every day and its still in one piece but a bit crickety. This glider does not recline, it only rocks gently backwards and forwards. Some of the online customer reviews have complained that the arms tend to break away or become loose after consistent usage and that the seat springs under the cushion tend to come loose as well. It also doesn’t have a locking mechanism to stop the gliding motion, but so far most customers don’t have a problem with this. If you want a glider for a small nursery hat is very narrow and fits into a small space, then the Stork Craft Hoop Nursery Gliders might be suitable for you. However, some customers have said that after consistent use the arms and springs under the cushions have a tendency to come loose. Although, the vast majority of customers state that it is really comfortable, easy to assemble and is at a great price point (less than $150). 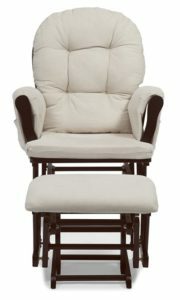 The Windsor Nursery Glider and Ottoman from Angel Line is the third narrowest glider on my list with an external width of 25.80 inches. It is just about the same width as the Stork Craft Hoop Glider, is also a similar price (less than $150) and it is a Best Seller on Amazon. The majority of customers really love this nursery glider saying that it is very comfortable, easy to assemble and it is a solid chair. 25.80 inches at widest point. White timber and grey upholstery. Padded arms and side pockets. Comes with a gliding ottoman included. Removable chair cushions for easy spot cleaning. Enclosed metal bearings for a smooth gliding motion. This was pretty easy to assemble and it’s a very solid chair. My husband wasn’t so sure how solid it would be when he saw how it was supposed to be assembled, but we have no complaints. Bought this chair 3 years ago and now purchased it again. The old one is still good but might break any time. I love this! We purchased for our baby’s nursery and it is so comfortable and cozy. Great price, comfortable chair, looks just like the pictures. Very happy! This set is awesome and so easy to put together! My wife and I looked at many gliders before taking a chance on this one and I’m glad that we did. Hardest part of the entire job was to bring the box upstairs! The back and arm supports are the only things that need to be attached to the pre-assembled base. The ottoman is already pre-assembled. The Windsor Glider does not recline, it just rocks gently back and forwards. Also, apart from being one of the narrowest nursery gliders, it is also comfortable for tall people, as there is still a few inches left on the headrest for people who are around 5’11”. If you are around 6’2” however, you will be pushing your luck if you want to rest your head while sitting upright in this glider. It also doesn’t have a locking mechanism to stop the gliding motion when you want to stand up, but only a few customers have mentioned this as a problem. 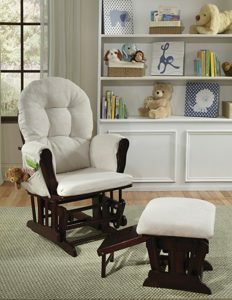 The WIndsor Nursery Glider & Ottoman from Angel Line is the third narrowest glider on my list and is an ideal glider for a small nursery. It is great for people who are around 6 ft tall – and shorter people are OK as well!. 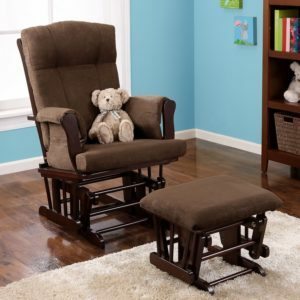 Most customers find that this nursery glider is very comfortable, easy to clean and assemble. Some however have found that the cushions are fairly thin and the springs break after a few months of consistent use. Coming in 4th on my list of the narrowest nursery gliders is this lovely chevron pattered chair by Stork Craft. It is very similar to the number 2 glider above – the Stork Craft Hoop Glider & Ottoman – and there is hardly any difference between the two gliders. As far as the width is concerned, the width of the Stork Craft Hoop Nursery Glider & Ottoman is 25.75 inches and for the Custom version is 25.80 inches – hardly any difference at all. The length and height of these two gliders is the same, as is their maximum carrying capacity (250 pounds), but the overall weight of the actual glider is slightly higher in the Custom Hoop Glider than the Hoop Glider above (43.0 pounds vs 45.5 pounds). The major difference is that with the custom version you have a large selection of different upholstery patterns and timber colors, so you can really create your own custom nursery glider. The price of the custom version is around $30 more than the non-custom version (my number 2 above), but it is worth it to have so many design options in this chair. 25.80 inches maximum external width. Different upholstery colors and designs. Metal, enclosed ball bearing for a smooth glide. Spot cleanable only (covers are not removable). Maximum carrying weight of 250 pounds. This is the second Stork Craft chair I’ve bought. 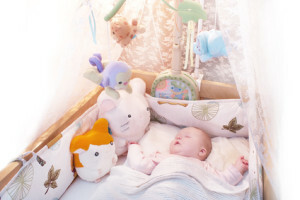 It goes perfect in our nursery and is great for rocking the baby to sleep. Easy to set up and very comfortable. Love the design and easy to assemble. Well worth the money. Had this thing for a year now and it’s been used almost every day. We love it. Bought it 8 months ago when our daughter was born. We use it daily to get her to sleep and give her a bottle. Our issue is I sometime fall a sleep in it with her. I bought this glider in 2014 before my son was born. We’ve now used it for two years straight through two different kids. It glides perfectly even after all this time. It does not have a click or hitch in the glide like some cheap gliders get over time. The Stork Craft Custom Hoop Glider and Nursing Ottoman does not recline, so you can’t lean backwards, instead it has a smooth back and forwards rocking motion. It also doesn’t have a locking mechanism, but so far, customers don’t have a problem with this issue. Some customers have mentioned that the seat cushion is too thin for them, so they have added an extra cushion. As far as suiting tall people, it seems that it is great for up to 5’11”, but once you hit 6′, you might have a problem sitting up straight and resting your head as well. This is a well priced nursery glider, that is the fourth narrowest on my list. You have lots of different upholstery and timber options with this glider, making it very easy to match your decor. The majority of customers find that this nursery glider is very comfortable, easy to assemble and glides smoothly and quietly. 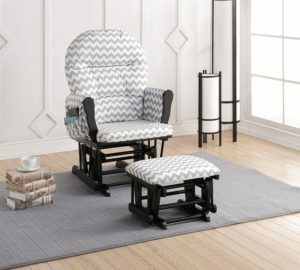 If you want a narrow nursery glider that you can match to your decor, it is definitely worthwhile checking out the Stork Craft Custom Hoop Glider and Ottoman. At the half way mark we have the Status Roma Nursery Glider and Ottoman, made from solid wood with a maximum external width of 25.80 inches. This lovely glider comes in three different color options – white timber and beige upholstery, cherry timber and beige upholstery or espresso timber and biege upholstery. Maximum external width is 25.80 inches. Padded arms for extra comfort. Polyester micro fiber blended fabric. Extra slide out stool with ottoman. Maximum weight capacity 250 pounds. I love this chair! Hubs put it together in half an hour or so and looks awesome. It’s also so comfortable I fell asleep on it in 20 minutes or so lol. For a great price we got a glider that is comfortable, and was pretty easy to put together. The first day we had it my wife spilled coffee on it and we were able to clean it out fairly easily. Overall very happy with this purchase and in retrospect would definitely purchase again. This is an amazing buy for the money. It is quite comfortable and seem to be made of good material. Matches the other furniture very well. This has been a life saver! My every day go to! My second baby only falls asleep if he is rocked to sleep unfortunately, so this chair has been amazing. 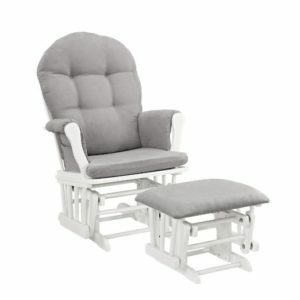 The Status Roma Nursery Glider and Ottoman does not come with a locking mechanism, so you can’t stop the chair from gliding back and forth when you want to stand up, nor does it recline. Regarding its comfort for both tall and short mums and dads, so far both seem to find this nursery glider more than comfortable. Although I think that there isn’t really much difference in the height of the backrest in any of the gliders – they seem to have a standard height. Also, a fair few customers have complained that this glider tends to break easily – the armrests tend to come apart from the back, the springs have popped and the wood has splintered. Most customers don’t have these problems, but it is certainly something to think about. Whilst this is a lovely looking glider for a small nursery, it does seem to have a few durability hiccups. Customers have found that the wooden frame tends to break, particularly in the arms and after a few months it tends to start squeaking. 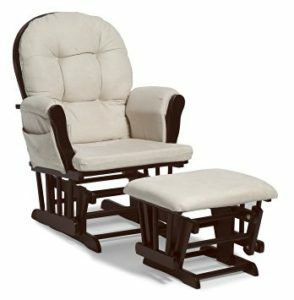 It is priced at just under $150, so it is most probably worth your while reading the rest of my nursery glider reviews, before making your decision. FYI: Currently, this glider is unavailable, however there is another one that looks very similar to this one, but is 35cm wide. If you are after the look and comfort and you are not concerned about the width of the glider, then this alternate glider might be suitable for you. You can check this alternate glider out on Amazon here. The Baby Relax Glider and Ottoman (by Baby Relax), is the 6th glider on my list of narrowest gliders and comes in at 26.60 inches at it’s maximum width. From the image, you can already see that this glider looks a little more sturdy and long lasting than the previous gliders and it is also a more traditional design as well. 26.60 inches at maximum width. Thickly padded and tufted seat back. Padded seat, arms and ottoman for added luxury and comfort. Rich espresso timber finish and chocolate upholstery. Maximum carrying capacity 225 pounds. Does not take up much space. Does a great job of rocking the baby. One of the best buys I have ever had on Amazon. Baby and I love this chair, my only complain is that I have to put a pillow for my lower back. Exactly what we wanted. New mom and daughter love it. My son is a big guy, 6′ tall weighing in at about 180 pounds and the chair works fine for him. So far they are very pleased with this rocker. Love it! Narrow seat, not for someone who is on the wider side. Easy to put together if you follow the directions. Looks great and feels very comfortable. Bottom line is that it’s a decent glider for cheap. It’s not the best, but it is a good deal compared to all the $300+ gliders out there. 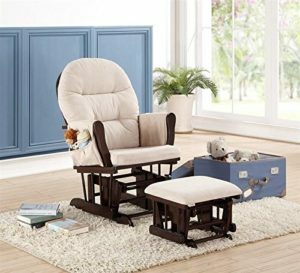 This Nursery Glider and Ottoman by Baby Relax doesn’t recline and doesn’t have a locking mechanism, but that is common with many of these gliders. Some customers have had problems with the framework breaking after a few months and others say that it squeaks too much. Most customers don’t have a problem, but it is worth reading the reviews before you decide. This Baby Relax Nursery Glider looks really high quality and sturdy, but customers still have problems with the frame breaking over time. It is a little more expensive than the previous 5 nursery gliders and since most customers are happy and it is one of the narrowest nursery gliders available, it is worth while considering. Dutailier are a well know brand who have been designing high quality nursery gliders for more than 35 years in Canada. 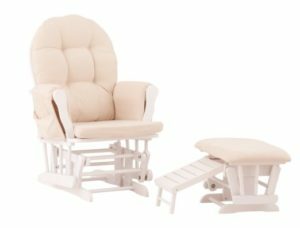 This is the first nursery glider on my list that actually glides and reclines, so if you want the narrowest glider and recliner, then this one is for you! It also has a locking mechanism to stop the chair gliding when you want to stand up. This is a great safety feature for inquisitive fingers (or cat’s tails! ), so you have just about everything in the Dutailier Sleigh Glider. It’s maximum width is 27 inches, so it is 4 inches wider than the number 1 on my list above. 27 inches at maximum width. 100% polyester micro fiber upholstery. Thick padded cushions and padded arm rests. Top quality steel ball bearings for a smooth glide. Multi-position locking mechanism for added safety and comfort. 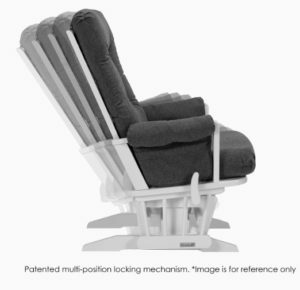 Fully adjustable backrest with 6 different positions. It was easy to assemble and my wife loves it. what more is there to say? I spent so much time looking for the perfect glider for our nursery. My husband and I are both on the taller side, I’m 5’10” and he’s 6′. We wanted to find a glider that would support or necks when we leaned back, this was surprisingly hard to find! We got the gray and white one and it was true to the picture. This seems like it’s high quality and should last us for many years. We are glad we spent the extra money for a quality glider as we spend a lot of time in it. I am 5’3″ and my husband is 6′ and we both can use it with equal comfort. That was key for us. By far the best glider I have tried, the most comfortable. Absolutely in love with this chair. My friend recommended it and I was hesitant due to how much it cost, but it was worth every penny. 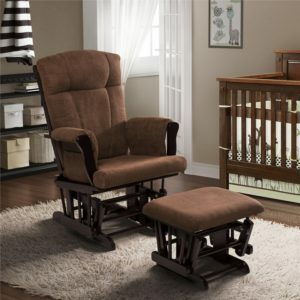 Love this rocker, it is so comfortable for both my husband and I. He is 6’2″ and appreciates the width and the fact that he can rest his head while rocking, which was not the case with many of the rockets we test-rocked. The Dutailier Sleigh Glider does not have any side pockets, so you can’t pop all of your odds and ends in the pockets. It does however, glide when it is reclined, which makes it a fabulous option for your nursery. Checking all of the online reviews, it seems that tall people over 6′ find this glider very comfortable and many fall asleep in it. 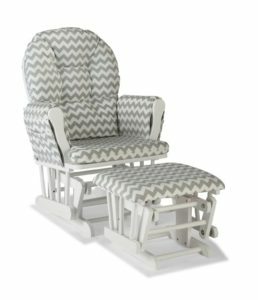 One point to really note is that this is an expensive nursery glider – it is around the $500 mark, so for this price you really expect perfection. 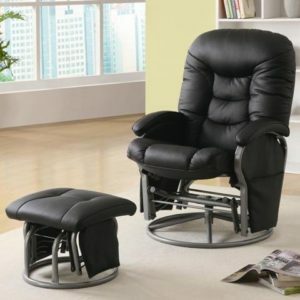 Unfortunately, whilst most customers are more than happy, some have found that this glider squeaks, and that the recliner mechanism isn’t very smooth or easy to use when sitting in the chair. The Dutailier Sleigh Nursery Glider is expensive, but it glides, rocks, has a locking mechanism and it fits tall people as well. So you have just about everything you need in a glider for a small nursery. So if you are looking for a good quality glider that is fairly narrow, this might be one to investigate. This lovely looking Nursery Glider from Coaster Home Furnishings glides, swivels and reclines, it has a locking mechanism, a solid steel frame and the padded cushions on the armrests are bolted to the steel frame. At 8th on my list of the narrowest nursery gliders, this one comes in at 28.50 inches at its maximum point. It is a middle of the range price at between $200 and $250 depending on where you buy it. Black or beige leatherette upholstery. Rounded front to seat for extra comfort. Pillow arm anchored to steel frame. Comes with an ottoman that also glides. This chair is very well made and was so easy to put together that my 8 mo. pregnant daughter had it all assembled before my son-in-law got home from work!!!! After reading the reviews, I was hesitant to buy. But I went ahead and purchased two matching chairs for my travel trailer. We love them. Better than what we expected. Got this chair for my daughter and she loves it . it’s comfortable and sturdy. I bought this as a gift for my mom. She loves the swivel rocker glider. It was so much cheaper than on other sites! Great buy for the buck! Awesome chair! Easy to put together, great for mom and baby!!! The biggest problem with this lovely looking glider is that quite a few customers have found that the leatherette is quite thin and either wears away quickly or shreds after continuous use. Another problem I noted is that some customers have said that the welding breaks and the chair becomes unusable, it starts to squeak after a few months and the reclining motion can stick. On the other hand, most customers like this nursery glider, saying that it is easy to assemble, super comfortable and worth every dollar. Reviews for the Coaster Deluxe Swivel Nursery Glider are mixed with most customers saying that it is comfortable and are happy with their purchase. Problems seem to be centered around the quality of the leatherette upholstery and the sturdiness of the steel frame – which being steel is surprising. Given that this nursery glider is one of the narrowest on the market and looks fabulous, it is worthwhile checking the online reviews yourself, before you make your final decision. The DaVinci Olive Swivel Nursery Glider has been designed with a high back for extra head and neck support (great for tall moms and dads) and has a matching lumber pillow for extra back support as well. It has a maximum width of 29.00 inches, so it is a whole 6 inches wider than my number one narrowest nursery recliner. One of the great features of this glider is that there is no assembly, so you just unpack it and you can use it immediately. The price in in the middle of the range at around $300, so it is a bit pricey, but it is also very comfortable and sturdy and has a maximum weight of 300 pounds. 29.00 inches at maximum width. Maximum capacity is 300 pounds. Comes in cream, light or dark grey. 100% soft and durable heathered polyester fabric. Upholstered ottoman included (does not glide). High back with lumber pillow for extra lower back support. Very comfortable chair, great color. My mom searched far & wide for a chair that would hold 300 lbs (I don’t weigh that much, but she wanted to make sure any visitors who might plop down in my chair wouldn’t break it). I use it daily to nurse and it’s comfortable. Got this for our son’s room. Great size for a nursery if you’re working with a small space. Pretty comfortable and good movement. Had to dress it up with another pillow and throw blanket since it resembles a business class airline seat. I thought I’d mind that the foot stool doesn’t glide but so far hasn’t bothered me at all. It is big yet compact and doesn’t crowd my nursery. I give it 5 stars. The glider moves extremely well, in all directions, making it very versatile and convenient for nursing. The ottoman is a great height for putting up your feet. I also love the high back on the glider – it gives great back support when nursing (I didn’t care for the included pillow, so don’t use it). The chair and ottoman come well packed and fully assembled. Overall, a really great purchase. The DaVinci Nursery Glider does not recline and it does not have a locking mechanism, however, it does glide and swivel smoothly. One of the complaints from some customers is that the ottoman doesn’t glide, but then other customers are happy as they can lean their weight onto the ottoman to steady themselves. A few customers have also found that they need support for their back as the angle of the backrest (which can’t be changed) is a little too steep. Another point is that it would be much better if the covers were removable and machine washable, instead of just spot cleaning them. All in all, this might be number 9 on my list of narrowest nursery gliders, but it is number 1 for comfort! On my list of the Top 10 nursery gliders, this one has the most happy customers with no-one saying that it breaks or becomes noisy after consistent use. So unless you absolutely have to have a very narrow glider, this might have be the glider for your small nursery. At 29.9 inches wide, this lovely, modern swivel nursery glider by Stork Craft comes in at number 10 on my Top 10 list of the narrowest nursery gliders. It has a 360 degree smooth swivel and a back and forth glide. The ottoman is sold separately, so as this glider comes in at around the $300 mark, you will be up for less than $400 in total for both the glider and the ottoman. 360 degree swivel nursery glider. 29.9 inches at widest point. 6 inch thick seat cushion. Eucalyptus hard wood frame with metal base. Maximum weight limit 225 pounds. This chair and the ottoman were very easy to put it together. Has a smooth glide and easily swivels. I searched long and hard for the perfect nursery chair. I wanted something comfortable, durable, and attractive. This chair has all of this and more. It is firm, and the rocking/swivel base is soooooo quiet, and while the fabric is a bit loud I can see why this is recommended for nurseries because this is a smooth microfiber fabric that resists stains in fact fluid will bead up on it without soaking in making this very easy to keep clean. The chair is outlandishly comfortable. The included pillow is a bit small though, so you may want an added support for the back if using the chair for multiple tasks. If just sitting and nursing, that is fine. The chair is small in overall dimensions, but it has plenty of room for the cushion so you do not feel cramped. If very tall though, it would not be for you. I think the limit would be about 5′ 10″ from a comfort perspective. There are not a lot of online customer reviews for this glider yet, but so far one noticeable comment is that this is not a chair that you sink into. The cushions are fairly robust and firm (not lux as one customer stated), but when you are feeding sometimes you want that extra firmness in your chair. Most customers also state that the additional lumber pillow is really too small to be effective and you will need to add your own cushion if you want extra back support. 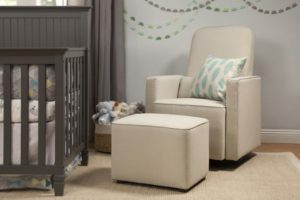 The combination of glider and ottoman is on the pricey side, but so far customers find that this is a very comfortable, quiet and smooth nursery glider for a small nursery. What are the best nursery gliders? There are lots of great nursery gliders on the market, some are more expensive than others and some have different features. On this page I am only looking at narrow nursery glides, because many people just don’t have enough space to fit in regular size armchairs or gliders. With my Top 10 guide to hand, you will have no problem finding the best narrowest nursery gliders, for your home – making your selection so much easier and stress free. There are plenty of stores that sell nursery gliders, but I have focused on Amazon, because they are a well known company and they have a good customer service. They also have a 30 day no-questions asked returns policy on all of their products. You can buy some of the best named brands on Amazon, so it just makes sense to go with someone you know and trust. So if you are wondering where to buy nursery gliders – then read my reviews and click on the links to learn more about your selection. Why are nursery gliders so expensive? It’s like everything we buy – you get what you pay for. In regards to nursery gliders, you will find that the more high quality and sturdy nursery gliders and rockers cost more money. You can usually tell the quality of a nursery glider, not simply by its cost (because high prices do not necessarily equal high quality), but by reading the online customer reviews. The lower priced nursery gliders (less than say $150) don’t have the same lifetime and resilience as many of the higher priced gliders. You tend to notice in the customer reviews that they say that the springs came loose or the arm rest padding was too thin, it tips over or it simply broke after a few months. Obviously, as with any product you will always find these type of comments. However, you don’t want to see lots of negative comments, instead you want at least 75% to 80% of the comments to be very positive (4 or 5 stars) with the remainder spit between 1, 2 or 3 stars. There is nothing wrong with the lower priced nursery gliders and for many us of us – these are the best ones for our budget. Since you will be sitting in your glider for many hours over the coming months, just make sure that online customers say that the glider you select is really comfortable and that it has mostly positive reviews. I think I went a bit off track there! So to answer the question “why are nursery gliders so expensive” – it comes down to quality, durability and features.